In a town that is obsessed with craft beer and fancy cocktails, the wine scene in San Diego sometimes seems to fly under the radar. And that’s just not right, because whether you think of wine as something you guzzle, or you’re a complete cork dork, there are plenty of places all over the city to get your vino on. Tucked away right next to the train station between downtown and Little Italy, their global wine list consists of more than 70 wines with a focus on small production and boutique wines. You can get a glass, bottle, or flight (of course), but the best day to do so is Tuesday, when their happy hour runs all day. 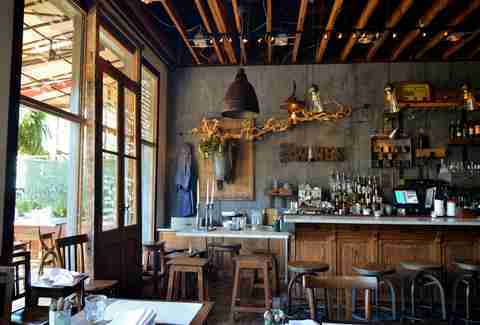 Dining at Finch’s feels like a trip across the pond without ever leaving La Jolla. You’ll find the restaurant tucked away behind a wrought iron gate and through a romantic, European-style patio. 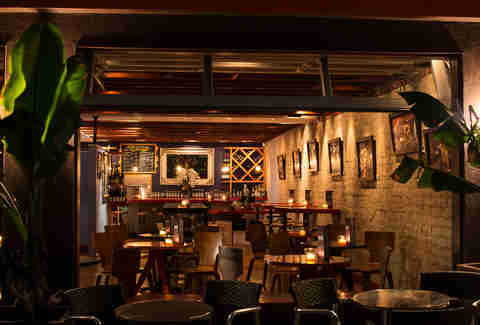 Their wine list has a selection of old and new world reds and whites by the glass or bottle. Glasses are 2-for-1 along with some food specials during happy hour Thursday-Saturday from 3pm-6pm. Stick around afterwards for live music on their patio. For the Downtown crowd Vin De Syrah is a wine bar with an edge. Unless you know what you are looking for, you just might miss the dark staircase that leads you to the underground bar. Once you find it, walking inside feels a little like following a white rabbit down into Wonderland. 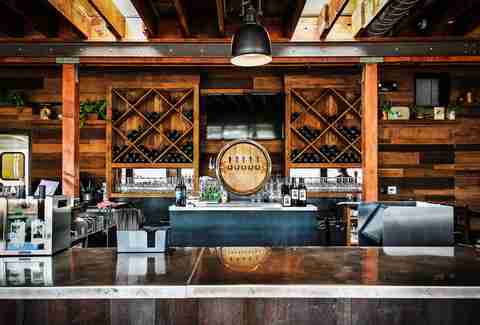 Their 12ft natural wood table is host to wine tastings from 8pm-9pm on Friday and Saturday nights that include three glasses of wine along with three food pairings. You can even arrange private tastings and a tasting of the wines from their reserve menu with varieties from France, Australia, Italy, Spain, and the US. 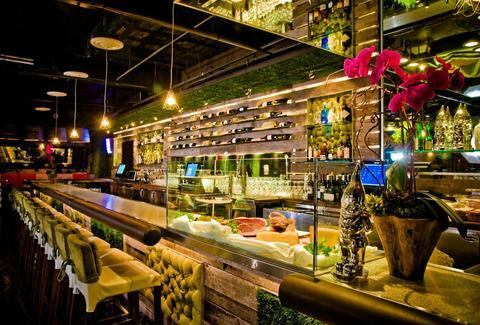 57 Degrees is the largest wine bar in town, housing a bar, retail store, and wine storage facility that can hold up to 600,000 bottles within its 16,500sqft. With all that space they have quite the selection of both domestic and global wines for you to taste and possibly take home (or drink on the spot). Either way, with all that wine you’ll need sustenance, so be happy that their kitchen is open until 9pm during the week serving cheese boards, paninis, sliders, and bites like prosciutto-wrapped dates. 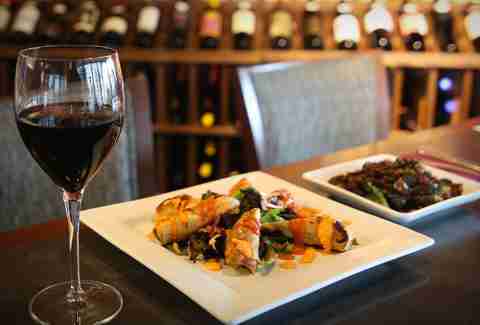 Right in the heart of Hillcrest, 100 Vines’ selection has an emphasis on old world wines with varietals available by the glass and by the bottle that pair perfectly with their Mediterranean-inspired menu. During happy hour you can score $6 wine flights from 5-7pm, and their front and back patios are the perfect places to brunch on Sundays with $1 mimosas. Yes, DOLLAR mimosas. 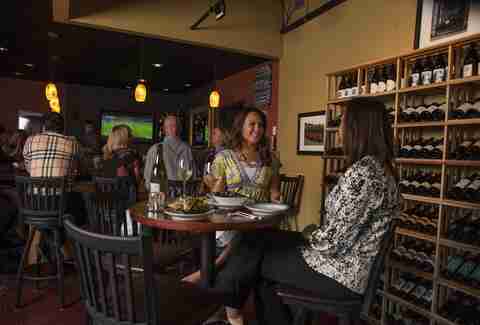 By day this place is known as PB favorite Turquoise Coffee, but at 5pm Turquoise Coffee becomes Turquoise Cellars, PB’s favorite wine bar. They break out the wine as the lights are dimmed, and the menu changes from wraps and acai bowls to cheese boards and flatbreads. Turquoise Cellars has wines by the glass and a selection of affordable bottles for sale that you can enjoy in their cozy candle-lit space for a $10 corkage fee. The Wine Pub just might be the most dog friendly place to have a glass of vino in San Diego. Not only do they have an expansive patio where fido is welcome to chill, they also have a menu especially for man’s best friend. On Wednesdays they even donate 10% of your total check to a local dog friendly organization. As if you needed more reasons to drink, they do happy hour all night on Monday, Saturday’s date night special is a three-course wine and food pairing, and to recover from date night, bottles of wine are 50% off on Sundays. Splash has more than 100 wines available by the bottle or glass, and you can taste 72 of those wines one ounce at a time with their self-serve tasting system. 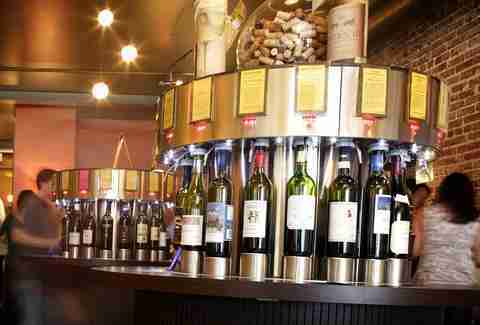 Just pre-pay on a plastic card, insert it into the machines dispensing the wines you want to try, and drink up. It’s a fine way to get a taste of wines that might normally be out of your price range. If you don’t finish the amount pre-paid on your card you can hang on to it until your next visit, or donate it and Splash will give the money collected each month to charity. WineSellar is more than just a wine bar; it’s a brasserie upstairs with a casual wine bar downstairs, plus a wine shop and a wine storage facility. Founder Gary Parker opened the first commercial wine storage facility in San Diego back in the ‘80s, now he and his wife Lori have owned WineSellar for almost 30 years. With a huge selection of about 2,500 wines thank goodness they offer wine tasting events every Wednesday in their wine bar so you’ll have a chance to sample as many of those as possible. On Saturdays you can put your wine knowledge to the test and participate in blind tastings in the brasserie, and they even have winemaker dinners so you can meet the vintners and owners of the wineries while you enjoy the fruits of their labor. This place isn’t just a wine bar; they are actually making their own wines on-site out of grapes sourced from all over Cali and Valle de Guadalupe. Join their wine club and you can choose from three options to fit your needs -- one of which is the Amphora Club and includes a refillable one liter bottle (like the Greeks and Romans used to carry their wine) which holds 33% more wine than a typical wine bottle and can be filled with the vino of your choosing once a month. If you just want to sample the goods come by the tasting room from 3pm-5pm during the week and 12pm-5pm on weekends, but stick around for the food. Executive Chef Suzanne Williams was the winner of the Food Network’s Chef Wanted, Mediterranean Madness competition and has a menu of Mediterranean tapas, flatbreads, and paellas that pair perfectly with the wines at Solterra. Dinner is served 7 days a week from 5pm-10pm, and they do lunch on the weekends from 12pm-5pm.